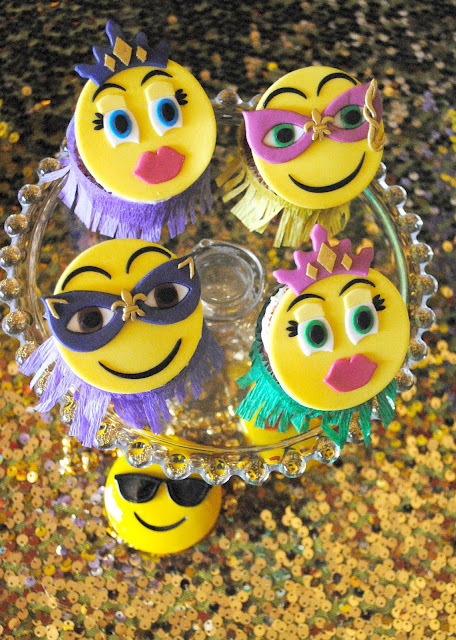 Welcome back to the second half of the Emojinal Mardi Gras party. Missed the first half? See it here. 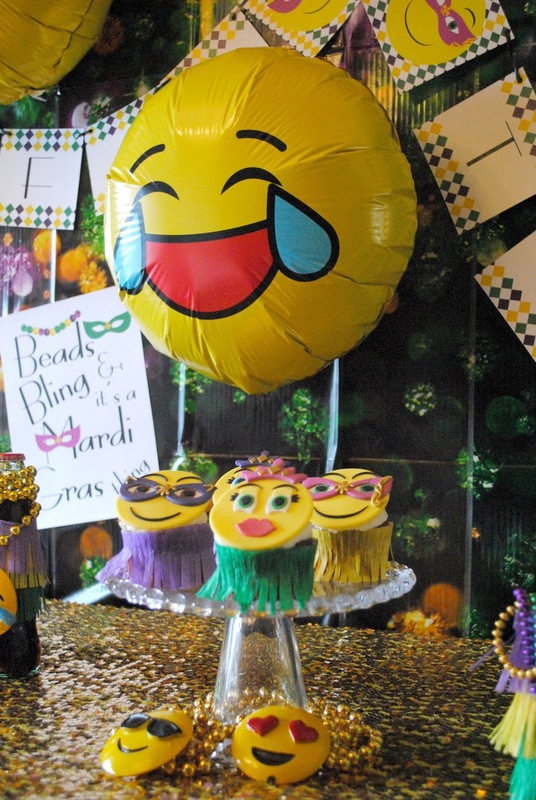 I had too much fun with this party mixing emoji's and Mardi Gras. When I first had this idea I honestly wasn't sure how the mix of the two were going to really look. But I'm loving it. 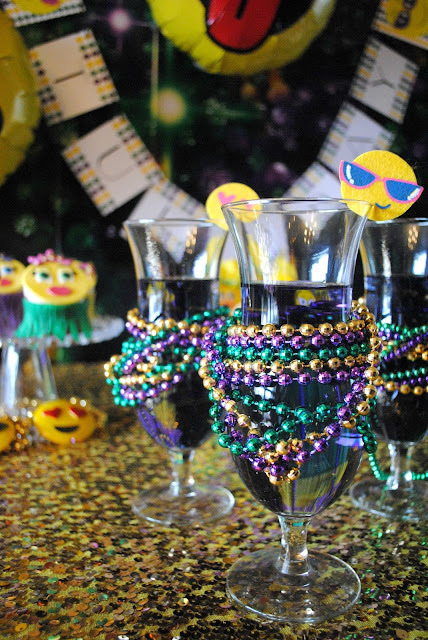 The inspiration for this party came from emoji Mardi Gras beads I saw on the Mardi Gras Outlets Facebook page. Those beads are the ones around the cake stand, below the cupcakes in this pic. I saw them and inspiration struck. 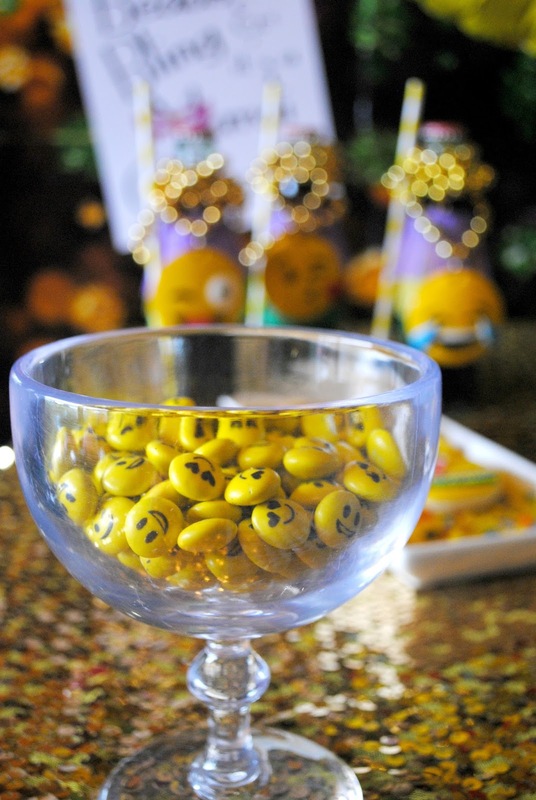 I contacted Bella Grey Designs, showed her a pic of the emoji beads and asked if she could create some printables for the party. For the cupcakes I asked Fondant Fantasy to create some Mardi Gras emoji toppers. I sent her the image of the beads and the printables and she nailed the look. Instead of cupcake wrappers I took tissue paper and cut them to make them fringy. Then I just taped the ends together so it would stay around the cupcake. I made the cupcake wrappers this way to match the float. I spotted these M & M emoji candies during Valentine's at Target and I HAD to have them. I knew I was going to be creating this emojinal Mardi Gras party and that these M & M's would be gone out of the store right after Valentine's so I bought them as soon as I saw them. 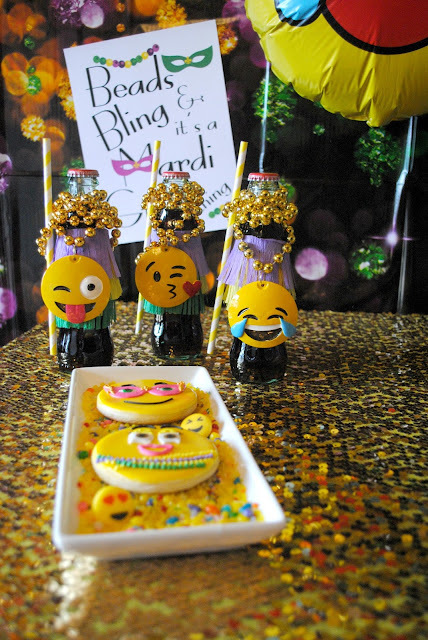 Mini Coca-Cola bottles are ready to party it up Mardi Gras style. I again took tissue paper and fringed it up to match the cupcake wrappers and parade float. I then added the emoji Mardi Gras beads which were the inspiration for this party and added yellow stripped straws. I love to nestle my cookies in a bed of something. Licorice sticks, sprinkles, sanding sugar or CandyFetti. This emoji mix from Sweets Indeed was perfect for this party. 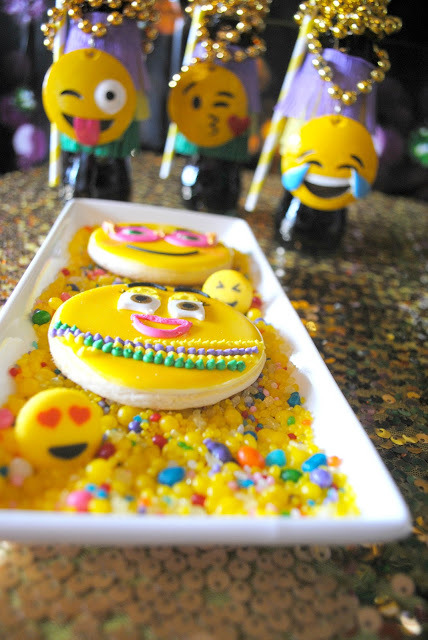 The colour just pops under the cookies and the mix comes with little sugar emoji faces. Every time I order cookies from Creating Awesomenessity I squeal with delight. She nails it every.single. time. These cookies just make me smile. Mardi Gras float coming through. 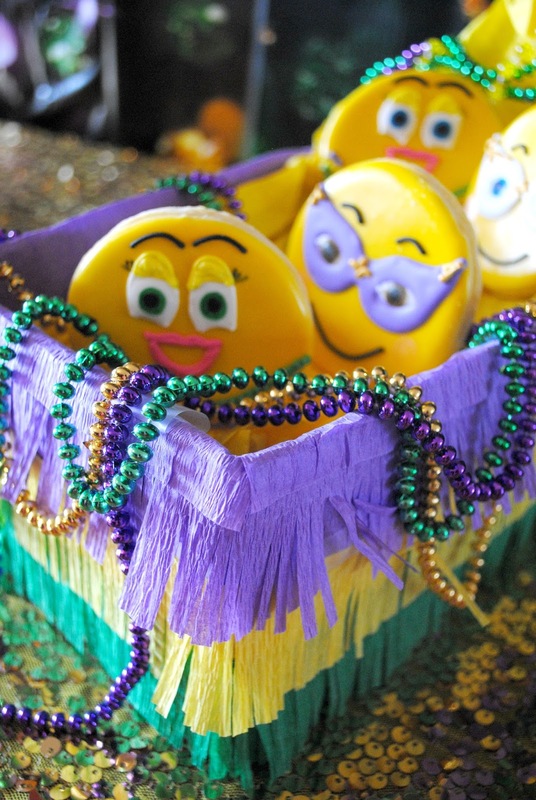 I wanted a unique way to display the emoji Mardi Gras cookies. I wanted to show them having fun. 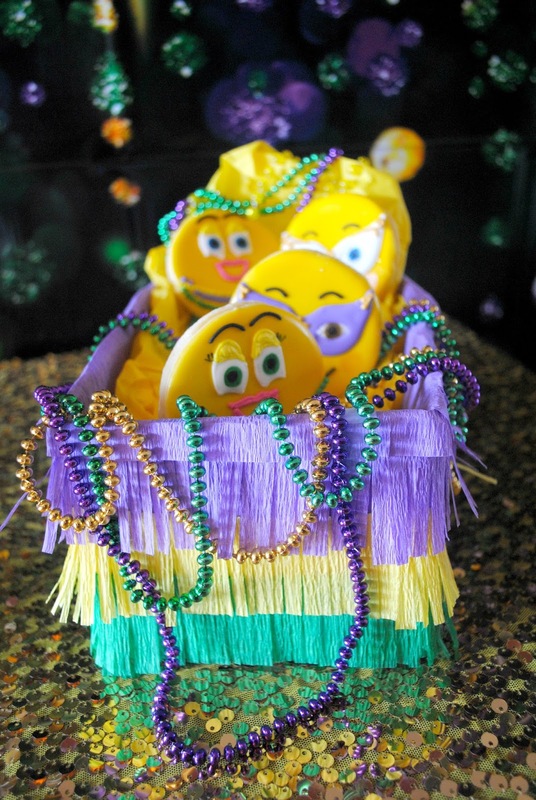 Mardi Gras is known for their parade floats so I created one and placed the cookies inside. I cut tissue paper into strips that would cover the shoe box. I fringed the tissue paper stripes with scissors, leaving a little bit at the top unfringed. Then I just added double stick tape to the back of the tissue paper where it was unfringed and stuck it to the box. Once I had the whole box covered with fringed tissue paper, I wadded up a couple sheets and stuffed them inside the shoe box. I draped the beads around the shoe box and gently placed the cookies on top the wadded up tissue paper I had placed inside the shoe box. You didn't think I forgot the Hurricane's did you? It's just not Mardi Gras without them. Because I like Hurricane's I already had the glasses on the hand. 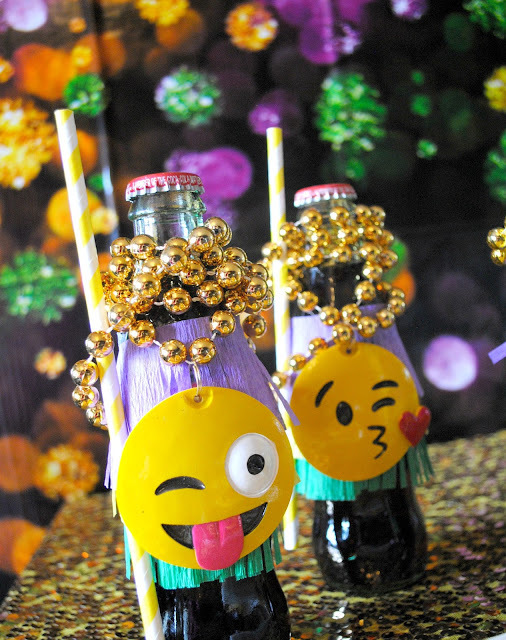 I wrapped them with more Mardi Gras beads and added an emoji sticker I found at Michael's. I hope you enjoyed this Emojinal Mardi Gras party. 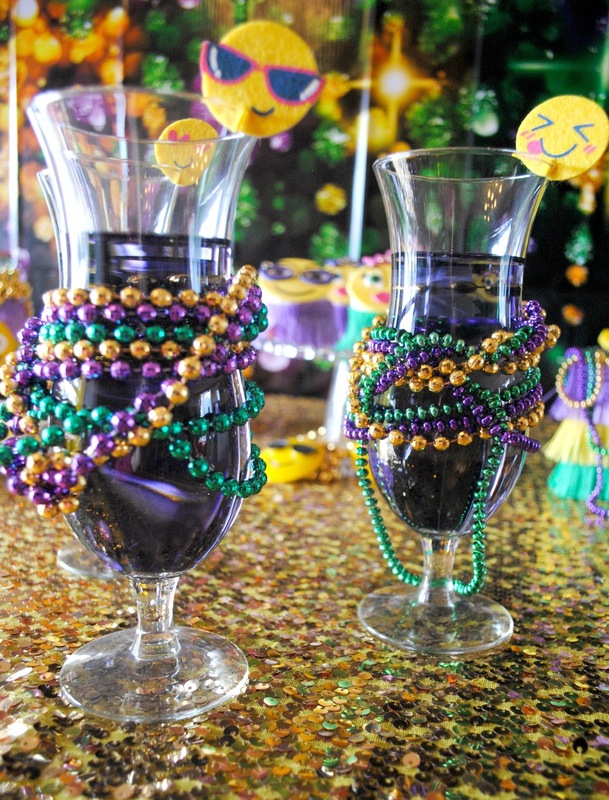 Pop over here, for more Mardi Gras inspiration. Thank you Lisa! I really appreciate you leaving a comment and letting me know how much you liked this party. Parties are truly my creative outlet. My art. I'm so glad you find inspiration and ideas to use in your own parties. What a fun and clever contemporary twist on tradition! My favorite thing is the float cookies display. Thank you! I had a fun time with this party. The float is my FAV too. Oh my gosh when I came up with this idea I thought, This is going to be too fun! 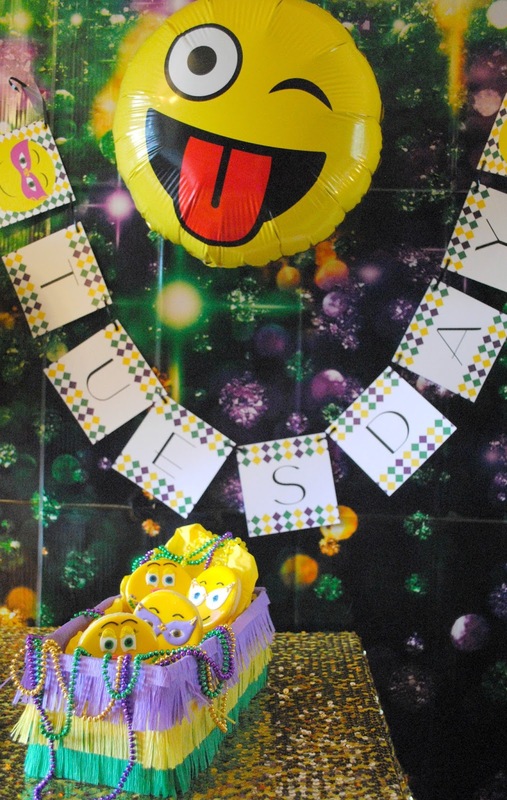 Emojis and Mardi Gras, definitely not something I would've thought about putting together. Good job, it's not only clever but fun!